Serena Williams beats Venus Williams: Here is their beautiful hug at the end of their U.S. Open quarterfinal match. Serena Williams showed uncharacteristic emotion in her victory over Venus at the U.S. Open quarterfinals. Serena Williams battled to 6-2 1-6 6-3 victory over her older sister Venus Williams on Tuesday to advance to the U.S. Open semifinals and move within two wins of a historic calendar year Grand Slam. After Serena struggled through a dreadful second set that included three double-faults—and one on a break point—two critical points at the start of the third set salvaged her match and put her ahead for good. Needing badly to turn around the momentum at the start of the third, Serena double-faulted again to allow Venus to get to 30-30 and near another break opportunity that might have killed Serena’s tournament. But an undauntable Serena fired a 100 mph ace out wide to go ahead 40-30, letting out an uncharacteristic scream of delight (matches between the two sisters are usually staid affairs) at having saved the critical game. She closed out the crucial hold on the very next point with another ace. 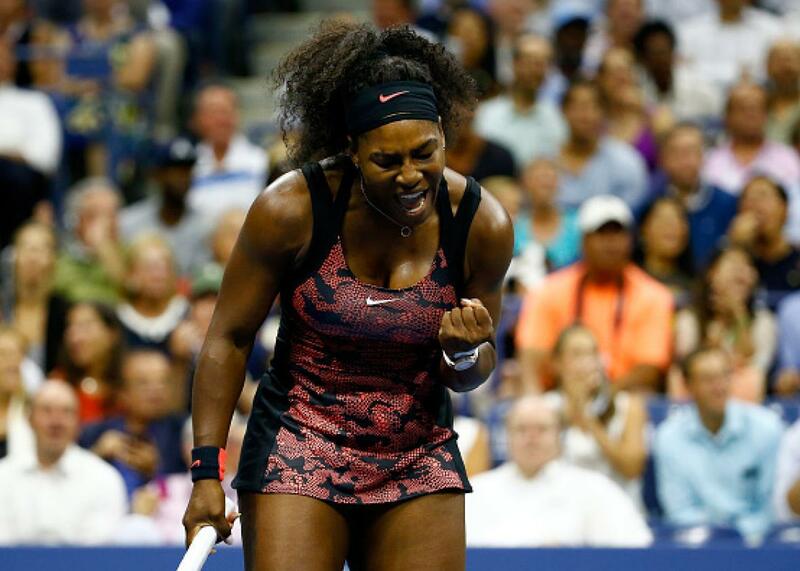 At the end of the match, Serena expressed her relief at having clung to that opening game. “Holding serve in the third set was I think all I could do,” she said. In the second game of the third set, Serena quickly built on that momentum to break Venus with a leaping backhanded winner down the line on one of her best points of the match. Again she let loose another surprising display of emotion, pumping her fists downward. Serena was the heavy favorite heading into the match and was 78-1 in her career after having won the first set at the U.S. Open, but her second-set struggles made her look vulnerable. Ultimately, the better tennis player prevailed and will go onto play Roberta Vinci in the semifinals for a chance to continue her campaign towards a fifth consecutive major victory, 22nd career Grand Slam trophy, and first calendar year Slam since Steffi Graf did it in 1988. With so much on the line between the two siblings, it was one of the tensest and most exciting tennis matches you’re ever likely to see. At the end, Venus—who battled incredibly hard against the clearly superior player—looked almost relieved not to have gotten in the way of her sister’s historic campaign. At the very least, she was happy for her baby sister.